I wanted the choose a subject that i was aware of and what I thought i knew it to be but i was never too sure about how wide it stretched. Testability was going to be the main focus! I had a basic plan in mind – Split the month into two parts. The first 2 weeks will be research and observation (My team and the wider Test Team) and the second 2 weeks will be trying to implement some improvements or make improvement suggestions. The test community has massively helped me during the research phase, there’s many great things that have been written about Testability over the last few years and these normally reference other articles or conference talks so it’s actually been a really enjoyable experience discovering a bunch of very interesting things. It’s going to be an interesting couple of weeks coming up, I’m planning doing a follow up post when the time is up to explain what worked and what didn’t work. I’ve had a lot of fun concentrating on one area, i’ve slipped up a few times and wondered down different paths but i’ve been focused enough to indentify these lapses and then got on track. Huge thanks must go out to Huib Schoots – His Great Resources page was the starting point for my research. Does anyone else take a similar approach to their learning or maybe you have a different method? I’d love to hear about it! I never did manage to write up my findings from this Testability experiment but I did write a post about how we use the information that I gathered, and a little bit extra, in my team at NVM. Next Next post: Everyone loves a bit of Bug Magnet! I love the idea of focusing in on one skill or area to learn for a period of time. I need to do the same thing. 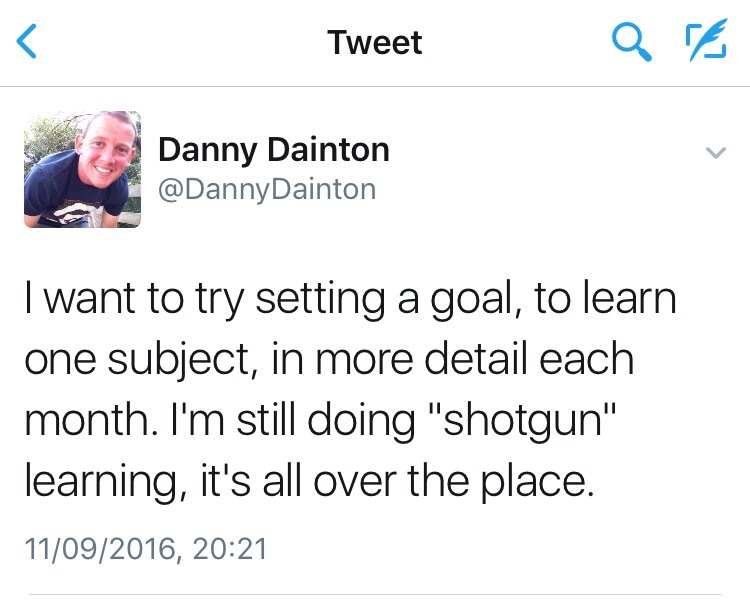 Right now my learning is still far too ‘shotgun’ in its approach. Thanks for a great idea! It’s been really useful for me to help me focus – I want to read about EVERYTHING but in order to save me from myself, I’ve had to do it this way. I would love to read about anything that you try and focus on for a period of time, be great to hear someone else’s experience of it. Yeah, I’m going to have to figure out what topics to focus in on. Do you have a list of topics you want to cover in the next few months or are you just picking a new topic each month as it comes up? I have areas that i don’t feel i have a good understanding of or ones that i have a shallow understanding of – I just want to beef that knowledge up some more to the point that i can confidently talk about them and provide good examples where I’ve applied that technique or process etc. For me, i have to be fully interested in wanting to know more about something. If i start something and i’m not feeling it, i’ll park that for a time when i’m in a better head space. With anything that we try to research, we are very lucky that some great pieces of work have been written already about the subject and then it’s up to us to contribute to that subject, so that the next people to follow a similar path have more material to reference. Feel free to link up with me at any point, if you ever want to chat through anything!